The Columbia River Gorge was the first of America's National Scenic Areas. Running 80 miles long through the Cascade Mountains the Columbia Gorge is unlike any other destination in the world. This wonderland include volcanoes, waterfalls, mountains and lakes all with many hiking, camping and photography opportunities. The Columbia Gorge is home to many artists, businesses, environmentalists, brewers and more. Join the country in recognizing the significance of this area by visiting The Columbia River Gorge National Scenic Area. Read about Cascade Locks located along The Columbia River Gorge below. West of Hood River, a segment of the Historic Columbia River Highway climbs along the nearly sheer basalt cliffs, which serve as a backdrop for the greatest concentration of waterfalls in North America. 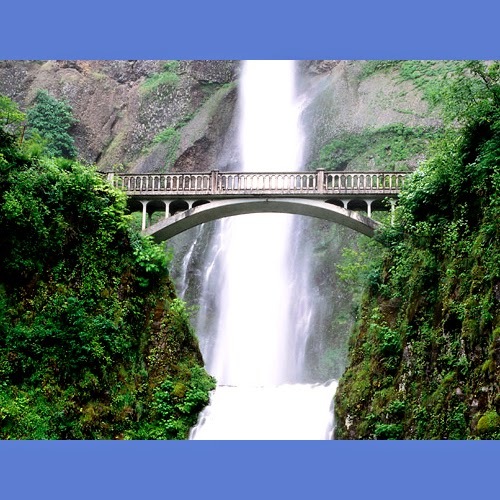 The most spectacular of all is Multnomah Falls, the tallest in Oregon and the second-highest year-round waterfall in the U.S. (after Yosemite Falls in California), with a total drop of 642 feet. Riverboat cruises aboard the Columbia Gorge sternwheeler depart from the town of Cascade Locks, offering modern-day travellers a chance to see the river from the viewpoint of early pioneers. Lindblad Expeditions offers longer river trips on the Columbia and Snake rivers aboard a 70-passenger boat departing from Portland, accompanied by noted historians and naturalists.